Published: June 25, 2013 at 11:45 a.m. Updated: June 26, 2013 at 07:29 a.m.
We will crown a new No. 1 in the NFL Network's Top 100 players of 2013 on Thursday night. That's NFL Network at 8 p.m. ET. And yes, I expect to be completely disgusted when Peyton Manning takes the top overall honors because I guess there is some NFL bylaw where you must ignore every one of Peyton's playoff failures while we celebrate his huge performances against the juggernauts of the league like Jacksonville, Oakland and Kansas City. Seriously, it's going to be Manning, right? That being said, I have a different view on who the number one person in the NFL Top 100 should be. My choice would be Calvin Johnson. Why Calvin Johnson? Well, I have six good reasons for it. Oh, and as luck would have it, I do a Pick Six column! Good news! Megatron still trails Jerry Rice through his first 92 games in most stastical categories. Rice caught passes from Joe Montana and Steve Young. Johnson has played with Jon Kitna, Daunte Culpepper, Dan Orlovsky, Drew Stanton and Shaun Hill prior to Matthew Stafford. Johnson has reached 100 receiving yards in 18 of his last 28 games. He set an NFL record in 2012 with eight consecutive games with at least 100 receiving yards. Johnson had at least 100 yards in 32 of his first 92 games. Rice had 33 through 92, but again, look at his quarterbacks. Since 2011, Calvin Johnson has 3,654 receiving yards; that's 722 more than his next closest competitor (Wes Welker). He's averaged 113.9 yards per game (next closest is Welker at 91.3) and has 38 receptions of at least 25 yards (next closest is Vincent Jackson at 30). 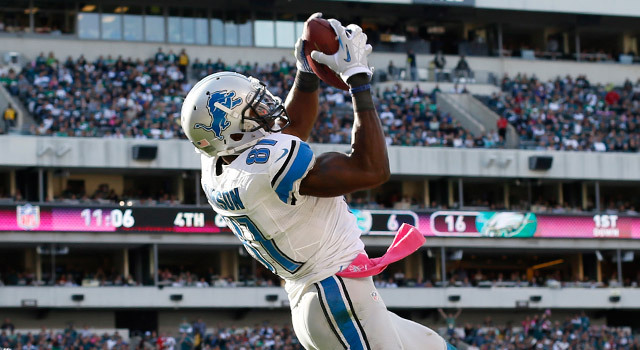 Megatron has recorded 169 receptions that have resulted in a first down since the 2011 season. The next closest player on that list is the Falcons Roddy White who has 150 receptions that have resulted in a first down. Believe in the Madden Curse or not, but most players make the cover after a career-year. The subsequent years are typically worse. Johnson went the other way and actually improved his numbers. In fact, his receptions and yards have increased in three consecutive years. You can make a case for Aaron Rodgers, Drew Brees, Tom Brady or Peyton Manning being the top quarterback in the NFL. There is no such debate when it comes to receivers. It's Calvin Johnson and then everybody else. That also makes him the top player in the game, too. The only other player who can make the âhead-and-shoulders above the restâ claim would be Adrian Peterson. But if this is based on the last two years, Calvin wins. But dang, Peterson was great last year. "Are Cruz and Nicks the best receiving tandem?..."